I never used to like cluster beans known as gawwarfali in hindi and kothavarangai in tamil. In our house only my elder sister used to like this and my mom would make this once in a while for her, that day rest of us will be very upset. But things changes isn't it? so when DH started to bring cluster beans I had no choice but to to cook and most of the time I do stir fry mostly without coconut and started to eat this nice vegetable. 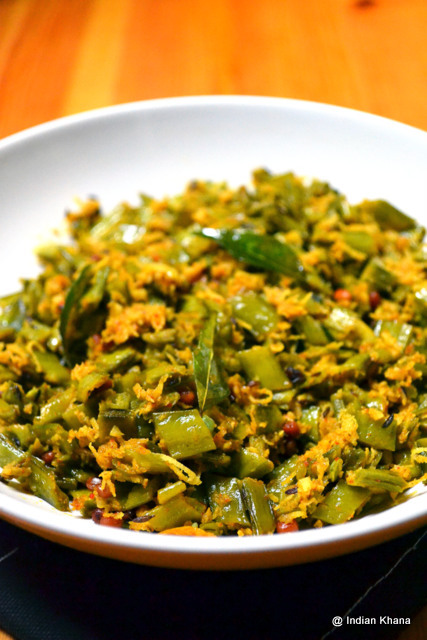 In my in-laws place they make garwaarfali-aloo sabzi, it's very north style of preparing cluster beans, I should post that some time. 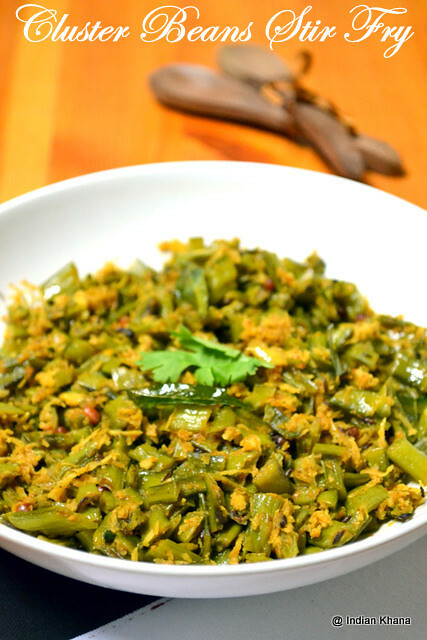 I make this poriyal the most easy way – no onion, no garlic and it goes well with dal/sambar/rasam just with anything. 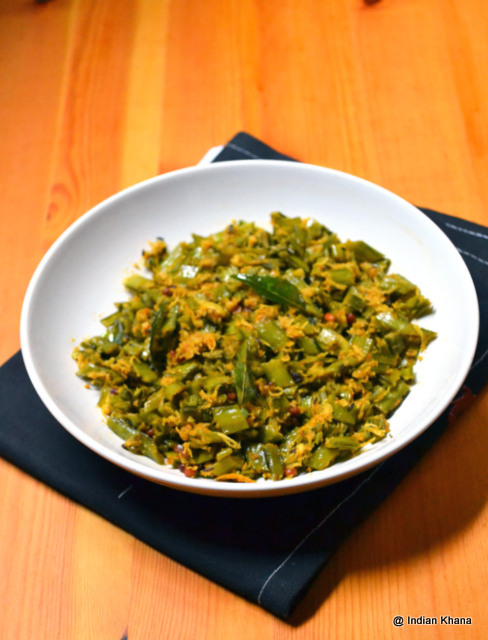 If you don’t like cluster beans then try this way of preparing this poriyal/thoran and you sure going to like it. So let’s check out the recipe. 1. Wash and chop cluster beans into small pieces like in picture below. Add little salt & sprinkle water, pressure cook for 2 whistles or microwave for 10 minutes. 2. In a pan heat oil and add tempering ingredients – cumin, mustard seeds and allow to splutter. Add urad dal, curry leaves and roast until golden brown. 3. Add cluster beans and cook in medium flame for 5 minutes, stir in intervals. If need add few drops of water to cook it well. 4. Add red chili, turmeric powders and salt, mix well and cook for 2 minutes. Add coconut, mix and cook for 2 more minutes or until poriyal becomes dry. 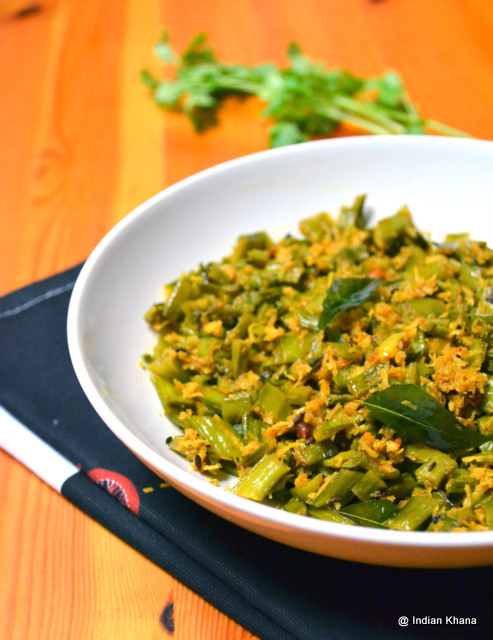 Our simple and super easy cluster beans stir fry recipe is ready. Love this stir fry simply with a bowl of curd rice.